My dad used to buy chunks of halva (a dense sesame candy) from the middle eastern market in our neighborhood and I always turned my nose up at the sight of it. 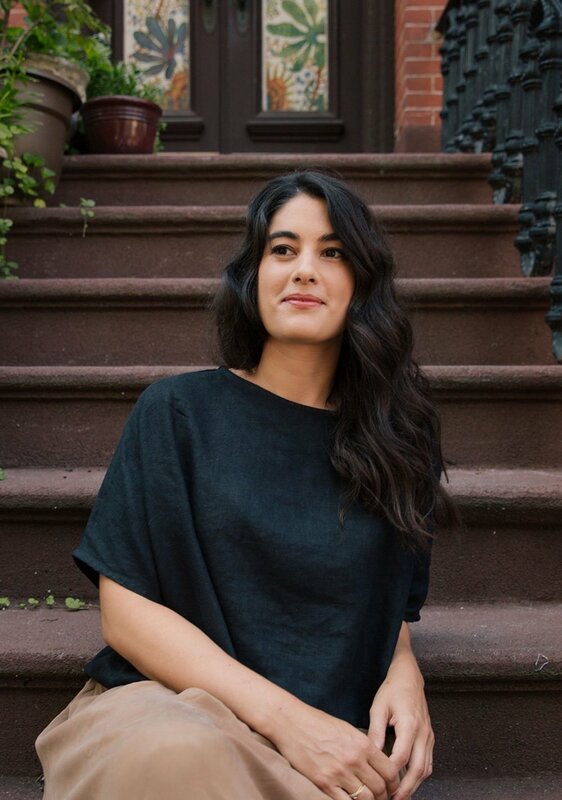 I wasn't a kid who shied away from strong flavors (hello, pickled garlic), but the flavor of halva was too much for my little palate to handle and I shied away from pretty much anything containing sesame seeds for a long time. 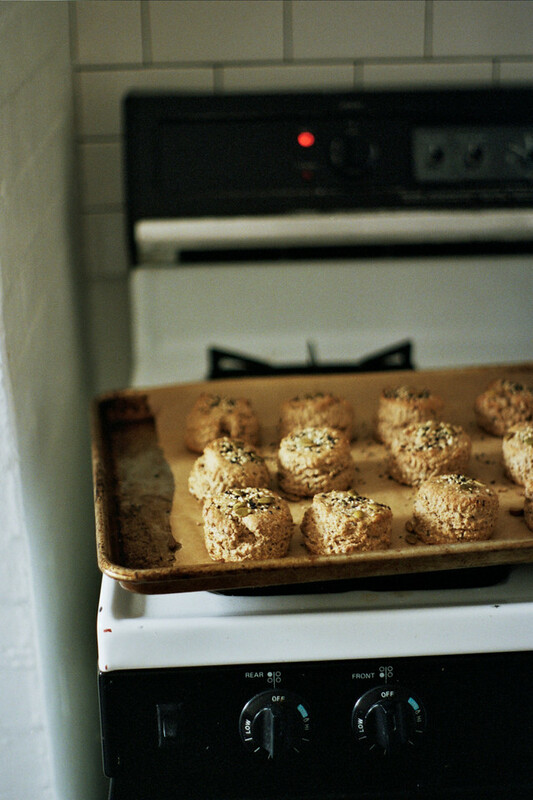 Thankfully, I grew out of whatever bothered me about their flavor and now I am a huge sesame and tahini fan.These hearty and wholesome tahini-enhanced scones contain a bit of sugar to balance all of the whole grain seediness and the slight bitter edge of the sesame paste, but it's not enough to make them truly sweet. I liked them best on the day they were baked slathered with butter and the tiniest drizzle of honey. The brand of tahini I used was quite liquid, if your tahini is closer to the texture of peanut or almond butter, add a couple of extra tablespoons of buttermilk. The dough should be soft but hold together after all of the liquid has been incorporated. It should also be said that these 100% whole grain scones are quite dense. 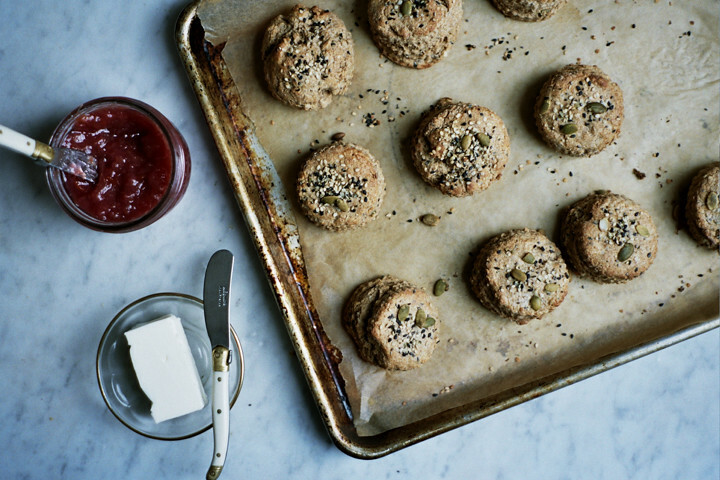 If you prefer a lighter scone, substitute 1 cup of all purpose flour for either of the whole grain flours. 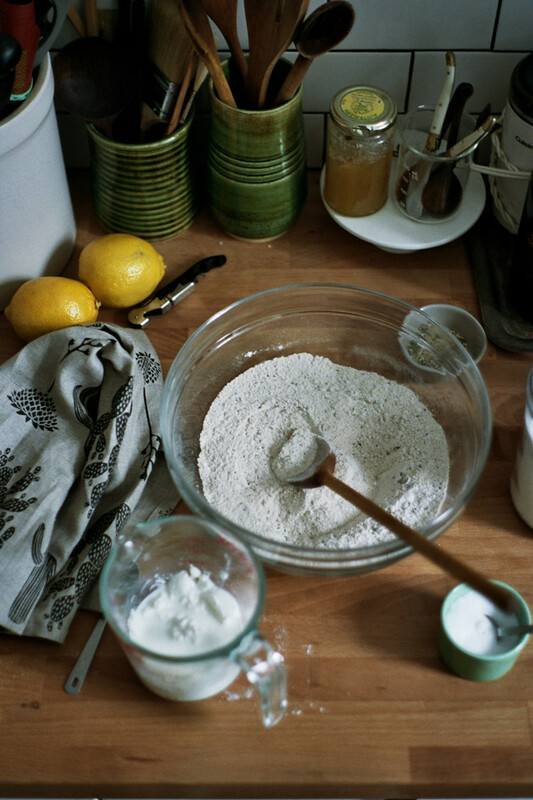 Combine the flours, sugar, salt, baking powder, baking soda and 4 tablespoons of the seeds in a large bowl. Use your fingers or a pastry blender to cut the butter and shortening into the dry ingredients. Combine the buttermilk and tahini in a measuring cup and whisk well to combine. Make a well in the center of the dry ingredients, then pour in the buttermilk mixture. Stir gently until just combined. If the mixture seems dry, add more buttermilk, 1 tablespoon at a time until the dough holds together. Turn the dough out onto a floured surface and pat it out until it is about 1 1/2-inches thick then use a floured 2-inch biscuit cutter to cut as many rounds as possible and set them on the baking sheet. Gather the scraps, pat them together, and cut as many rounds as possible. 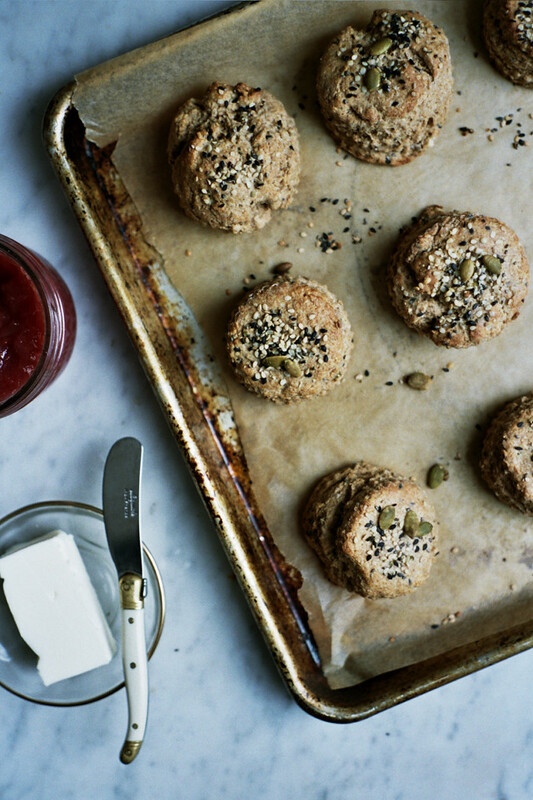 Brush the tops of the scones with water or milk and sprinkle with the remaining 2 tablespoons of seeds. Press gently to make sure the seeds adhere to the scones. Bake until golden brown 20-25 minutes. Serve warm and fresh with butter and honey.